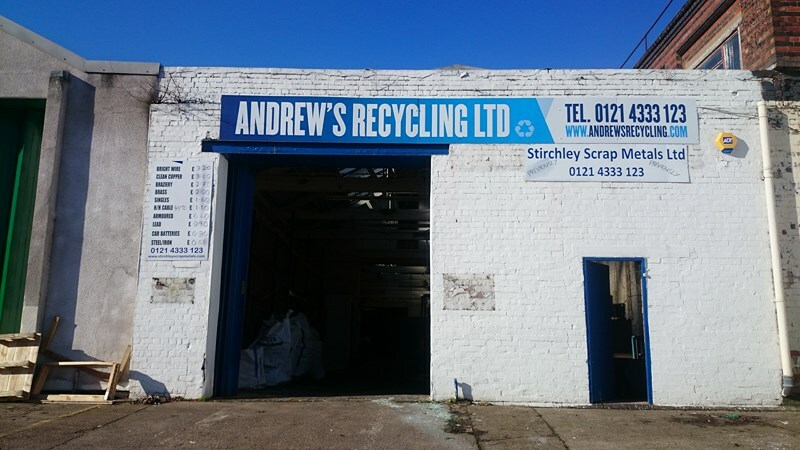 Andrew's Recycling Ltd started trading in March 2013. We are the only fully licensed Scrap Dealer in South Birmingham. In February 2015 we moved to our new 7000 square foot facility on Pershore Road. We buy all non-ferrous metals. Open to trade customers only, this includes builders, electricians, plumbers, roofers and local businesses. Please phone 0121 4333123 for a quote on your scrap metal or click on Metals tabs above. We pay by either same day bank transfer or by cheque. or a UK passport with a recent utility bill or bank statement, please click on ID tab to view further details. Also closed all Bank Holidays. SORRY, WE DO NOT DO ANY COLLECTIONS! We use calibrated digital scales, you are free to check them and weigh yourself!